Proper maintenance, preventative care and cleaning ensures your beautiful new copper range hood will maintain its elegance and refined style for many years to come. 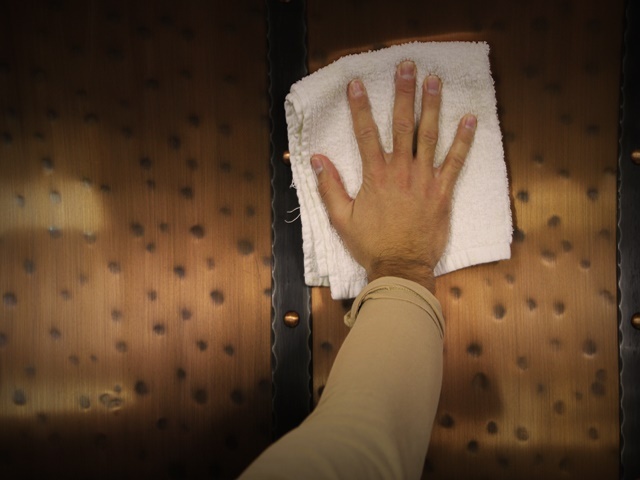 Use our range hood cleaning guide below to take the appropriate, and necessary, steps in preserving and maintaining your exquisite Custom Copper Range Hoods. Luckily, our custom copper range hoods are very easy to maintain and will never require any additional lacquering or waxing. Our range hoods work exceptionally well in low-maintenance households! If you have any questions on the necessary steps to take, or products to use that are not mentioned below, please call our office location at 360-891-6540, or shoot us an email, and we will be happy to help you in any way we can. This cleaning instruction guide applies to all of our range hoods. Use a clean, soft, non-abrasive cloth or towel with soap and warm water. With the damp towel wash your range hood in the same direction as the patina pattern. Please do not scrub with any acid based chemicals or abrasive material (steel wool or sanding grits/sponges), this may damage the lacquer finish or patina. It’s best to dry your copper range hood completely with a towel to prevent any dry spots. You should clean your range hood as often as needed, depending on how heavy you cook and how much dust develops on range hoods’ surface. Apply a light coat of Mothers Carnauba Step 3 Wax (you can even use just a soft towel) to your range hood after cleaning, this is recommended be done on all types of finishes. Great preventative maintenance prolongs lacquer life and strength. Waxing should be done every 6 – 12 months, depending on how often you cook.